I’m ready for my close-up, Mr. DeMille. . . .
It’s my birthday today. Most of my adult life I have been less than thrilled with birthdays (outside the great excuse for eating lots of chocolate cake). On my twenty-first birthday I happened to pick up an issue of Cosmopolitan magazine, which just happened to have an article – swear to God! – about how physically, it’s all downhill after twenty one. But life is nothing, if not an interesting journey, right? This morning I woke up, and in my still dream-fogged brain, this thought occurred to me: I am not so much getting older, as I am getting more practice at living well and good and happily (most of the time. . .or at least, a proportionately larger percent of the time). I credit my friend Bob Lee as the reason for this new insight. He posted a birthday message to me last night that said, Happy 21st again! You must be so good at having those birthdays now. It must have sunk in while I was sleeping. So, yeah. Happy Birthday to me! I am the star of my day today. The ‘Moose hat” picture explained: This was at a fancy dress party (costume party here in the US) at the Fforde Ffiesta June, 2012. 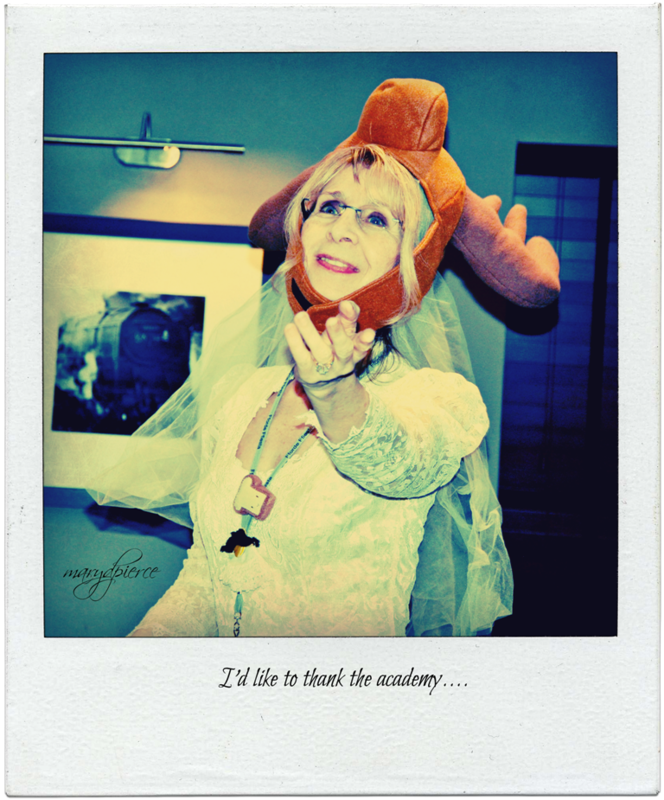 I was ‘Moose’ Havisham (a combo of Transient Moose and Miss Havisham who are both characters in Jasper Fforde books. I won first place. It is also my sister’s birthday today. We are not twins, but we are near twins. Irish twins, some people tell us, as we are one year apart to the day. Sharing a birthday was not always easy for us. Kids do not like sharing birthday gifts, which was something we occasionally had to do. And we have very different personalities and interests. About the only trait we have in common is stubbornness, so you can guess how well we got along. 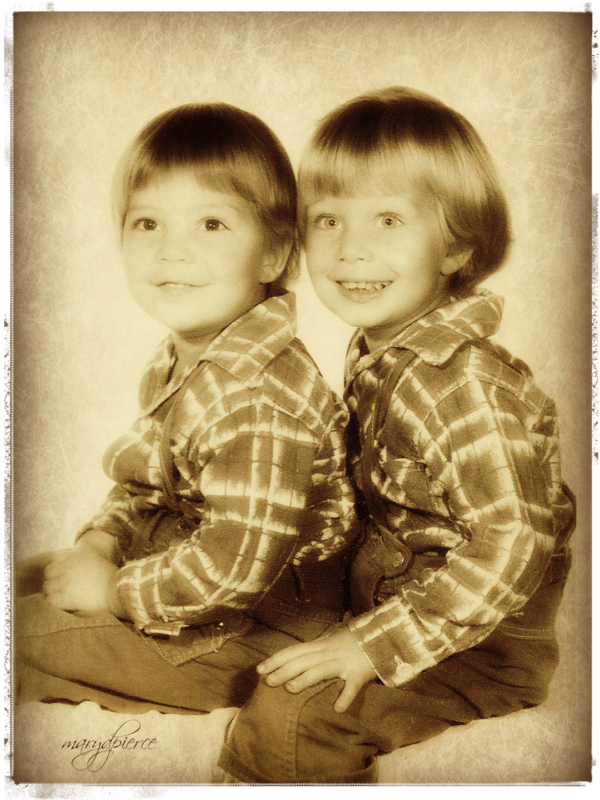 To add to the illusion of our twin-ness, my mother dressed us alike until we revolted. But we are grown-ups now, we get along really well and enjoy each other’s company when we can spend time together. And we never, ever have to share birthday gifts anymore. Which is good, because she is getting lobster and tequila for her birthday, neither of which I like and one of those things I’m allergic to. 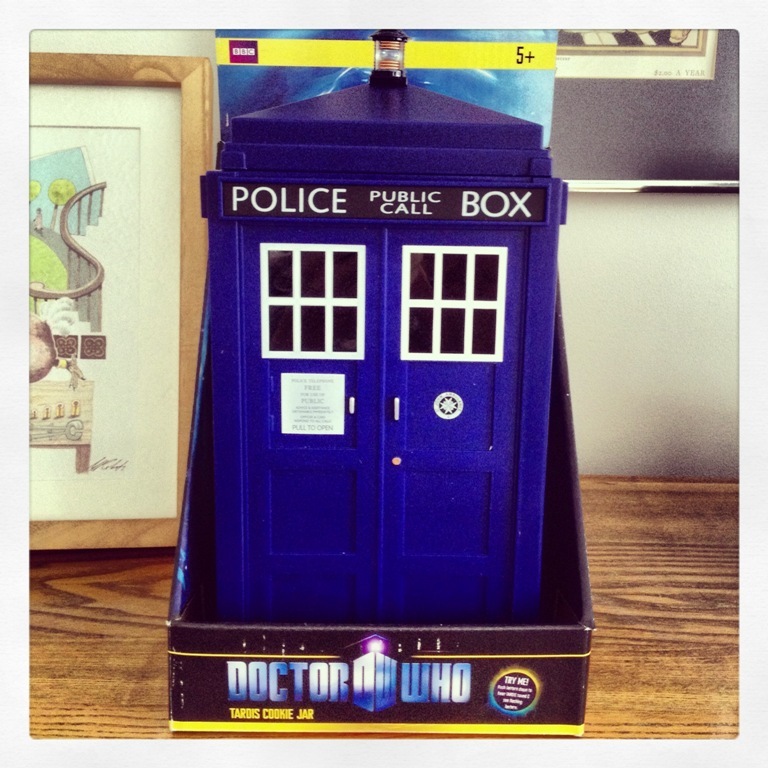 And this is what I got today for my birthday, because I am an avid Dr. Who fan. Care to guess what I plan on keeping in my Tardis? So, here’s to me and here’s to my birthday twin. May we live our lives guided by love. ← My man, Wilkie . . . . Celebrate! A Very Happy Birthday to you, dear Mary. I crack myself up! When I wake up in the morning my head is filled with random, disjointed thoughts. This morning, as I pulled myself into a sitting position, swung my legs to the floor, and stood up, that line from ‘Sunset Boulevard’ popped into my mind. And then I knew what I would blog about. Happy Birthday! Sorry I missed the party and the cake, I am sure it was good. I hope you enjoyed a re-visit to 21. I wouldn;t want to be 21 again, unless I could take what i know now back with me in the portal. too many missteps on the dance floor of life! Have a great day, post-birthday. Ah, Clay, I made many, many missteps, and I don’t really want to go back (unless it’s for a visit in my Tardis). But the dance has been sublime! Great photos (I especially like Moose Havisham) and Happy Belated Birthday! Thank you for comment, and for stopping by. I’m pretty partial to Moose Havisham, myself. Oh, I’m a day late. Happy birthday! My Mom had six children. I was the third. Both the fourth and the fifth children were born one year and one month after the one before. Mom loved to dress the three of us the same. A “revolt” as you put it was inevitable. I still cringe when I see some of those old photos. Happening upon that article in Cosmo on that day is freaky. Here’s hoping that you continue to prove that author wrong. A belated happy birthday to sis too! Thanks for the birthday wishes, Ray. As for the Cosmo article, I never forgot it because of the timing. I remember exactly where I was, the chair I was sitting in when I read the article – I was so happy about turning 21, about being an adult, and then that. Big downer. I have since learned that physiology is very different than one’s frame of mind, and that we can control. I’ll pass on your birthday greeting to my sister! Love the moose hat! A belated happy birthday wish to you and your sis. My boyfriend is from a family of 4 kids, 3 of which share the same birthday. Amazing! Wow. Three out of four kids in the same family with the same birthday. What are the odds of that, I wonder? I have just one kid and his birthday is five days before mine. This year my oldest nephew and his wife had their first baby on my son’s birthday. Happy belated birthday! I love what your friend Bob said. Very awesome. So Happy Belated 21st! Thank you kindly. May we all celebrate our 21st for as long as we want!! Happy belated 21st to you, Mary. Why, thank you Mr. Thorn! You are hilarious Mary! I enjoyed this post so very much. Makes me wish I knew you in person. Hope you had a great birthday. Aww, thank you, Mimi – for both comments. That’s high praise. I’m glad you enjoyed it!